I cheated and used a little Ultramarine and Alizarin Crimson in the background to get a quicker control of colored darks. But the face is almost exclusively Naples Yellow and Venetian Red. That red is very powerful and must be used in small doses. The muted nature of those two face pigments makes them much easier to use than mixing up from raw primaries like Cadmium Yellow and bright red. I feel I am approaching real skin tones. Thanksgiving Self Portrait, 11 x 16 oil on board. 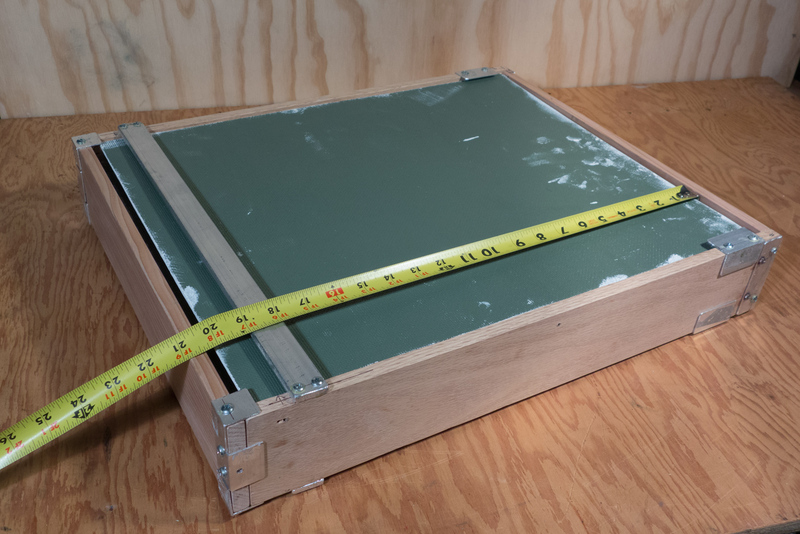 I’ve been combining hiking and painting for a couple decades now and have come up with a lightweight system to carry wet canvases (boards), and the easel a few miles from the car. 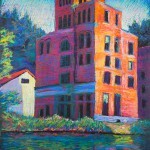 Pastels have been my main medium until this fall, when I switched to oils. I bought the Raymar wet canvas carrier, and it is ok, but my boards were a little too thick for it. I started out painting on 3/16 inch plywood left over from lining my truck bed. 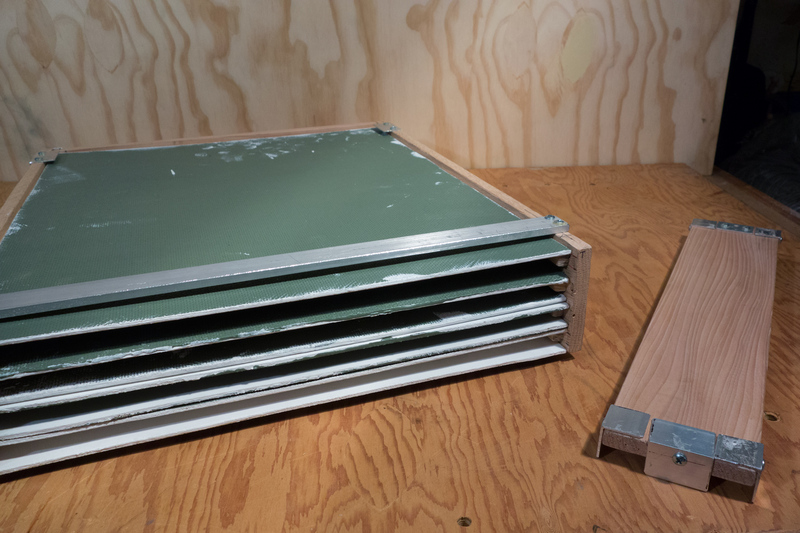 So, rather than ordering more from Raymar, I made my own, and made them a skosh wider to accomodate both standard 1/8 inch Masonite (MDF) boards, and the 3/16 inch furniture grade plywood, both of which can be found at Home Depot. 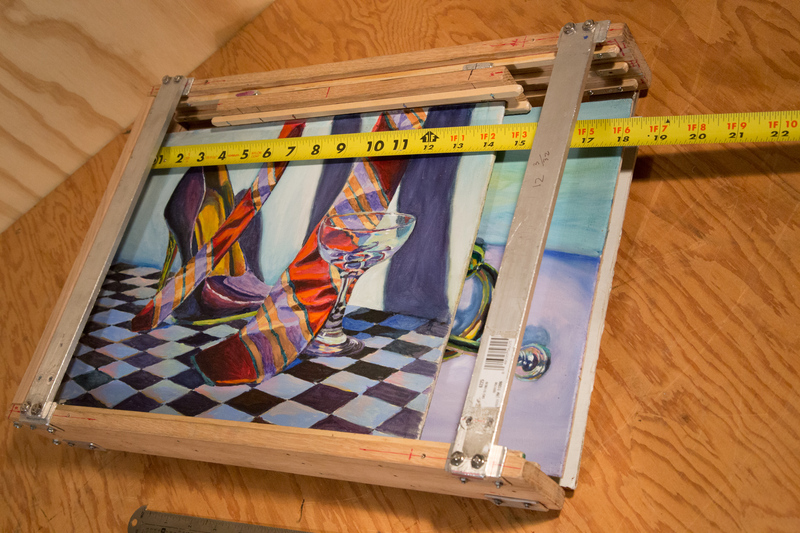 If you have ever tried to backpack several wet paintings, you know that you basically need a shelving unit, with the paintings being the shelves that slide in and out. They should only touch the shelving unit (wet canvas carrier) on their unimportant edges…preferably only the outer 1/4 inch or less. 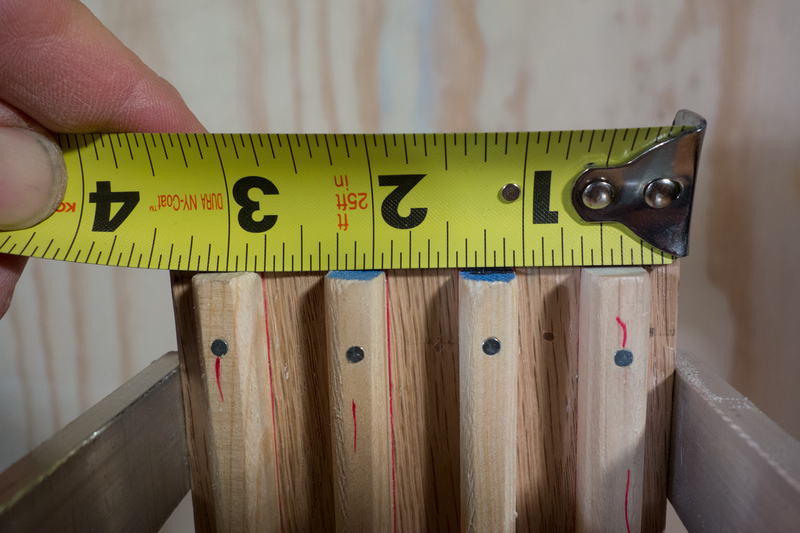 Home Depot has 1/4 and 3/8 inch square “dowels” in lengths of 3 feet. 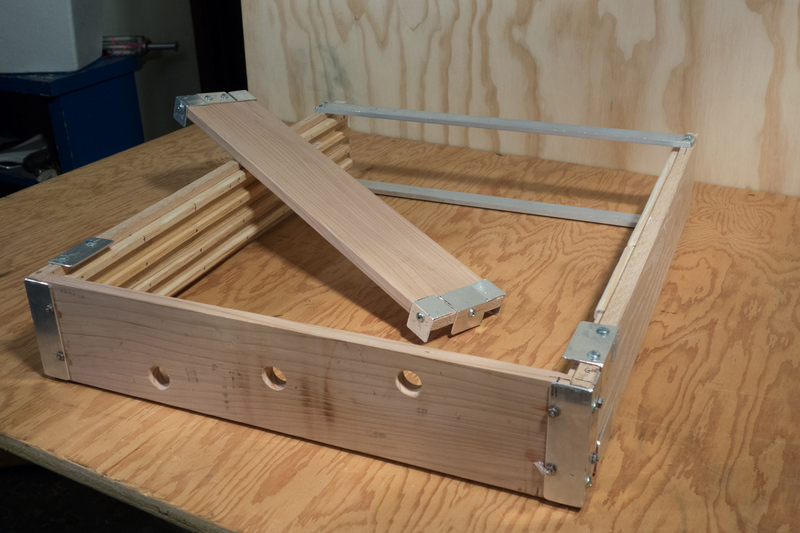 I used the 1/4 inch size to make rails for my 12 x 16 inch carrier, and 3/8 inch size to make the rails on my 16 x 20 inch box. I figured the 16 x 20 inch size would be more likely to sag. But I didn’t want the rails to mark the painting any more than necessary, so I rounded the 3/8 inch rails with a rasp file. 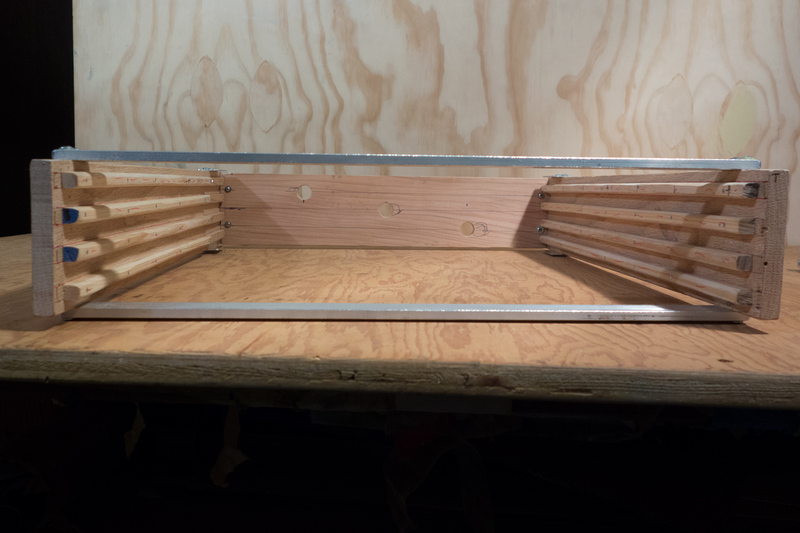 I glued the rails in with wood glue, and short nails, pre-drilling the “dowels” so they wouldn’t split. I used oak for the side frame. 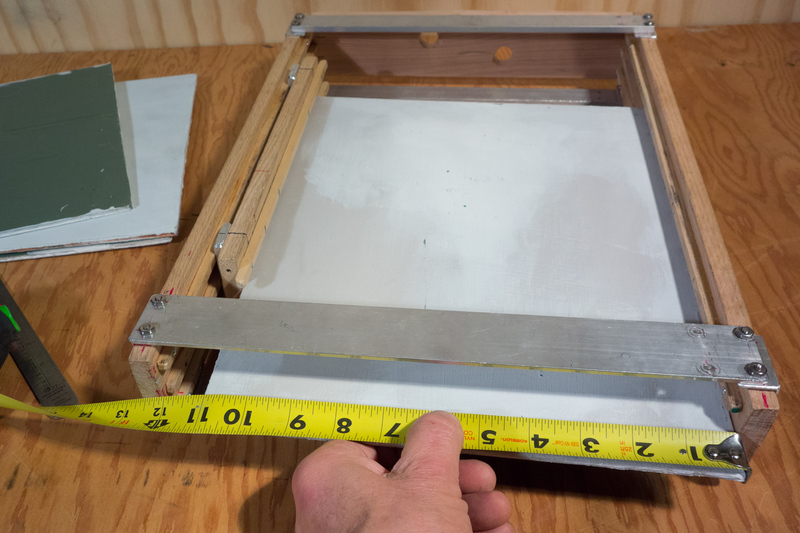 The big 16 x 20 inch wet canvas carrier weighs 3 pounds empty, and it can carry 8 paintings. This big box may turn out to just be a storage box in the car for wet paintings. I may still try to figure out a way to carry 2 big boards face to face in my backpack. I’m thinking about some kind of 4 cornered elastic thing that holds two wet paintings face to face, rigidly without allowing them to touch. In case you’ve never seen one of these, in the wider slots (1/2″), you put two wet paintings back to back. As you may be able to see here, I used 3/8 inch wood rails, glued and nailed in place every 1/2 inch. I also left a 1/4 inch gap for a single painting on the outer edges, for a total capacity of 8 wet paintings. I’m hoping the paintings themselves can form the outer sides of the box, but if not, I may glue on some outer plates of 1/2 inch foam core. The photos below show my 12 x 16 inch box. I made it big enough to handle 12 x 18, and built an adaptor to make it work with 11 x 14 as well. I got this idea from Raymar, and the other wet canvas box makers who all sell adaptors. 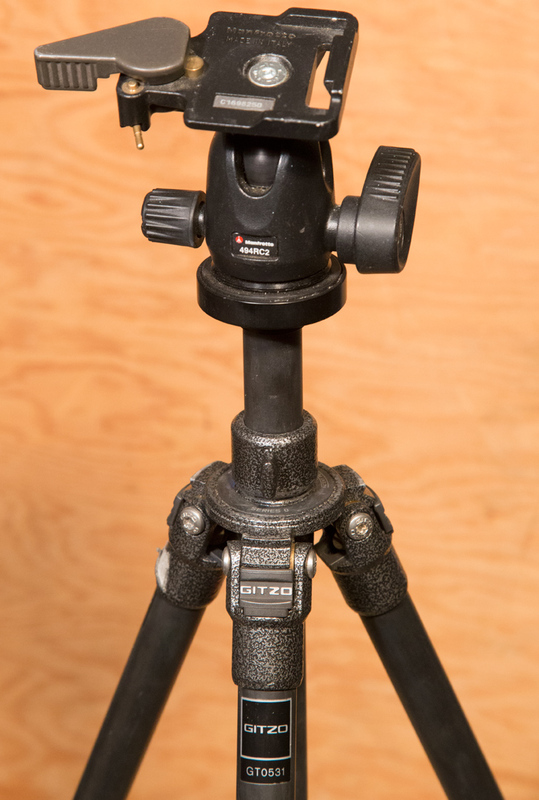 I use a full size carbon fiber tripod called the Gitzo Mountaineer GT-0531. It weighs 1.6 pounds without the ball head. It is amazingly rigid, but priced accordingly around $500 if you can still find it. I bought it back when I was working full time in web design. 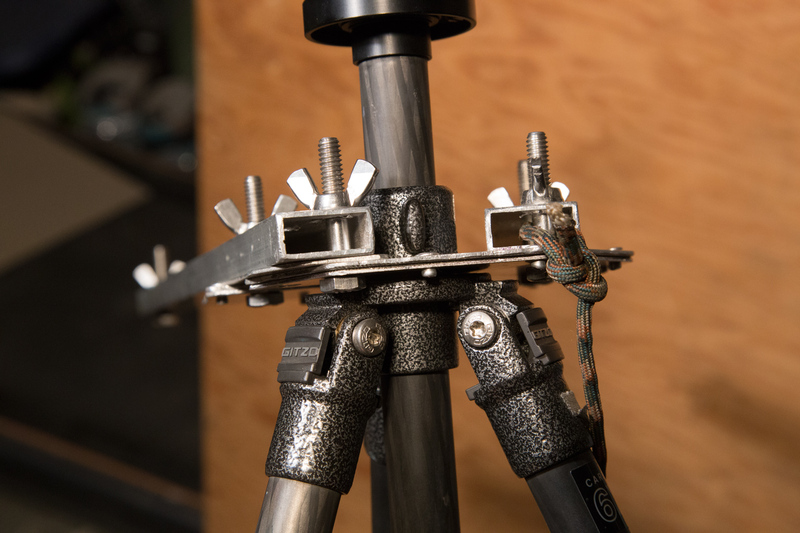 With any camera tripod, you need a shelf. 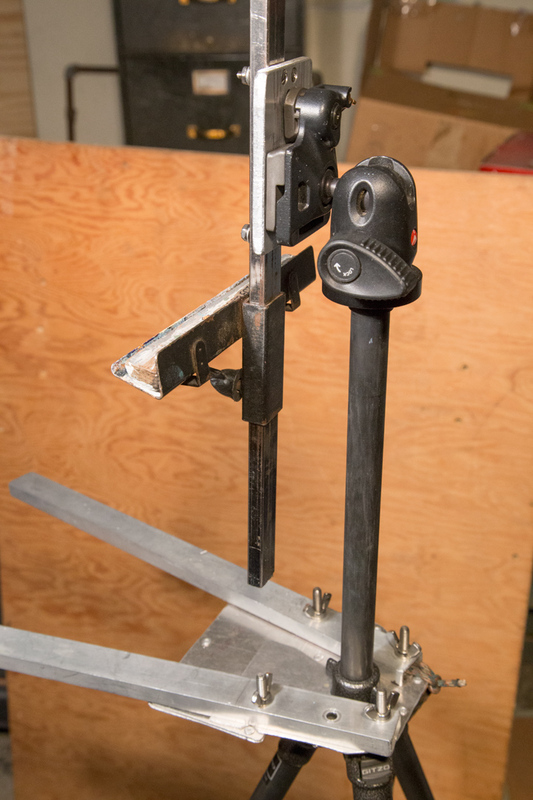 Since this is thin walled carbon fiber, I decided the shelf should attach to the metal head where the tripod is strongest. I had an old steel Italian easel sold by Daniel Smith from last century. 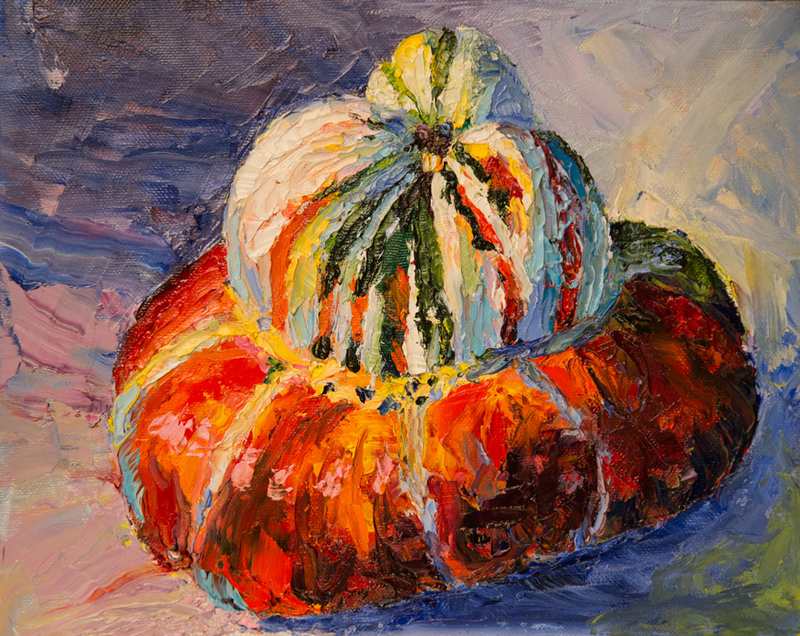 I loved the way it allowed me to paint any size from 5 x 7″ up to 24 x 36″. But those steel legs had to go, too heavy! 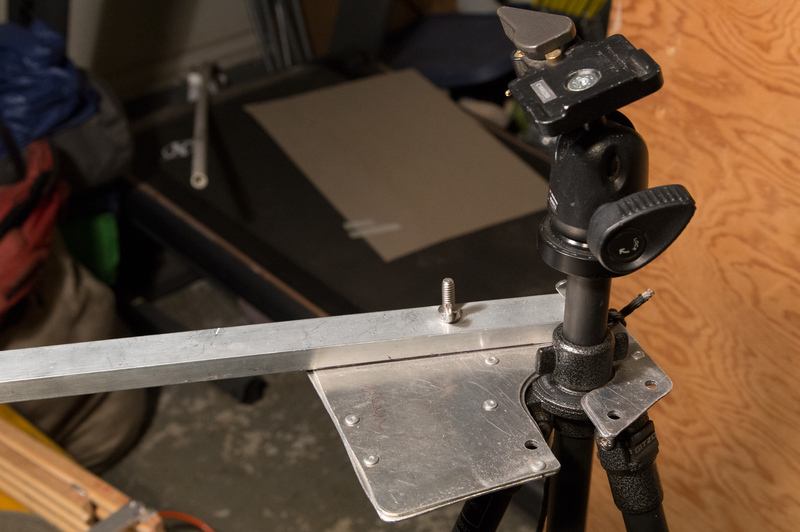 I took just the important part (slider bar with painting clamps) and mounted a 1/4″ aluminum plate that would allow it to connect with the quick release plate on my Manfrotto ball head. 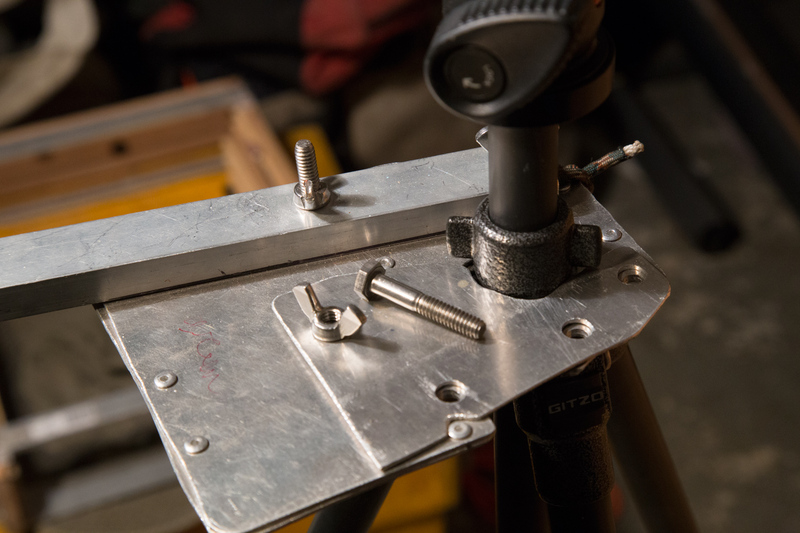 I drilled and tapped several holes of 1/4 x 20 in case I stripped one out in the field. The rains have come and I’m staying home at least every other weekend to paint still lifes. Sitting out in my drafty studio slaving away over a painting sounds lovely, but the reality is less romantic. I still don’t really understand my new oil paint medium. I’m getting a lot better, and have done some nice (maybe even sellable) work, but the paintings go through long awkward phases where I really dislike them. 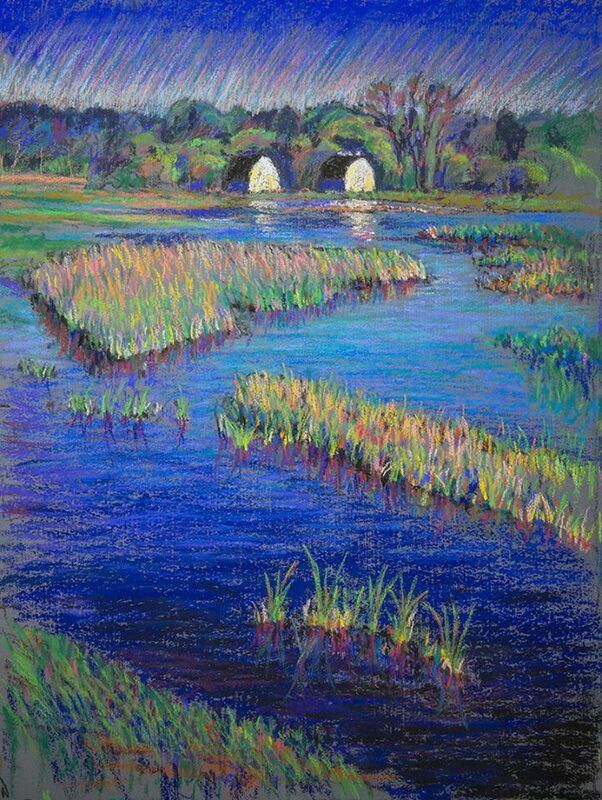 There have been many times where, if I had been working in pastel, I would have simply crumpled up the paper and tossed it in the garbage can. But because I’m working on wood board, the paintings can’t be destroyed easily. I keep plugging away, hoping to bring them to life. So that’s been my weekends lately. The last month, with one exception have been painting basically 7 days a week. I like to think of it as career training. Whenever I’m home I’m out in the studio. I did climb last weekend with Lolo, Mindy and friends at Vantage. I’m still warmed up from Smith and was able to get up my favorites cleanly: Split Beaver, Tangled up in Blue, George and Martha, Whip Saw, Air Guitar. But climbing leaves me empty now. I didn’t even take pictures. Instead, as I walked around, I wondered if I could paint the views in oils. 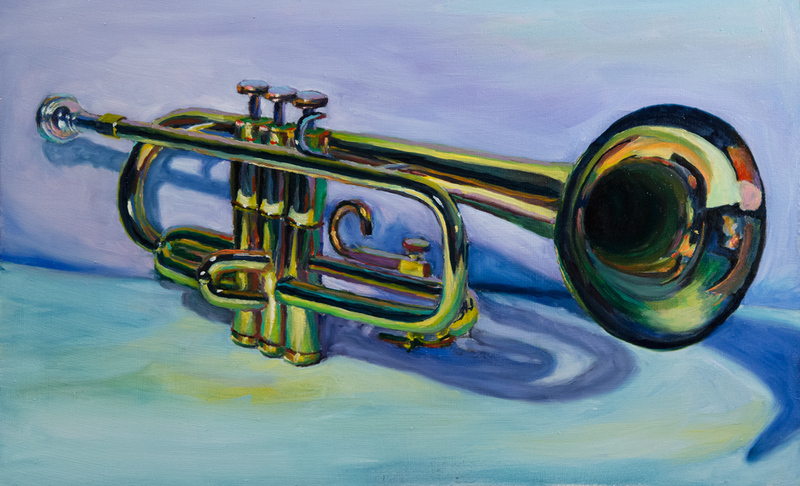 Sue borrowed a trumpet at work and I’m 12 hours into a trumpet still life. It has been awkward since the start. It looks good, but it doesn’t sing. This is my second full day on it and I’m almost scared to open the studio to look at it. So, despite all this, it’s time to go to work. Perhaps I can find a good talking book, or some music to keep me company as I work. I’m not a quitter, if this one doesn’t fly, I will start another one. Nobody said this was going to be easy. UPDATE: Looks like it turned out. Not sure it’s a silk purse, but it shines nicely and I like it. Great exercise in painting metal. I was third chair cornet in Junior High. There wasn’t a fourth chair. 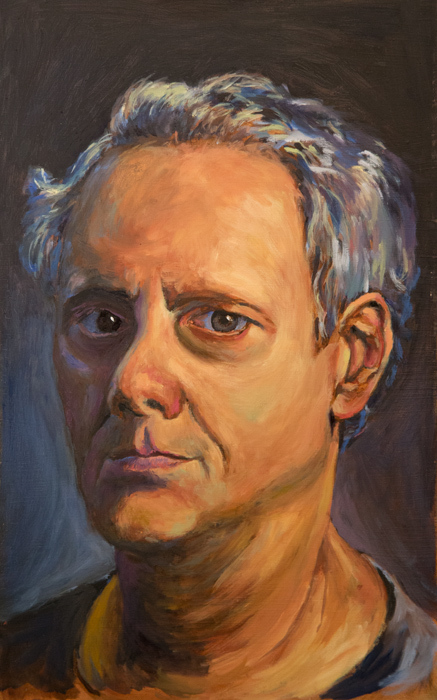 I finished a 15 hour self portrait in oils yesterday. I am getting comfortable with this new medium. The learning curve was fairly short, and it gives me lots of ideas for rainy day painting in my studio. I did my first new oil painting in 43 years last week. And I led Damnation Crack cleanly! I know painting and climbing have nothing at all to do with one another. What can I say…I’m complicated. I have a box of oil paints I bought when I was 17. I painted for a few months, then gave them up. After seeing the wonderful oil paintings Barbara Newton is doing after she switched over from pastel, I had to give it a try. I also have wanted to try palette knife painting. To my great surprise, my first painting turned out absolutely amazing. I’m working on another one, thinking I might do a series. It seems that my eye for color and composition carrys directly across to the new medium. Who knew a new medium could be so exciting! I love the freshness that comes through with knife painting. Every stroke has variety, as long as I don’t over mix the colors. And speaking of color, I no longer have to worry about having the right $4.00 pastel crayon…I can just mix it up for free from these old oil paints…talk about a blast from past. 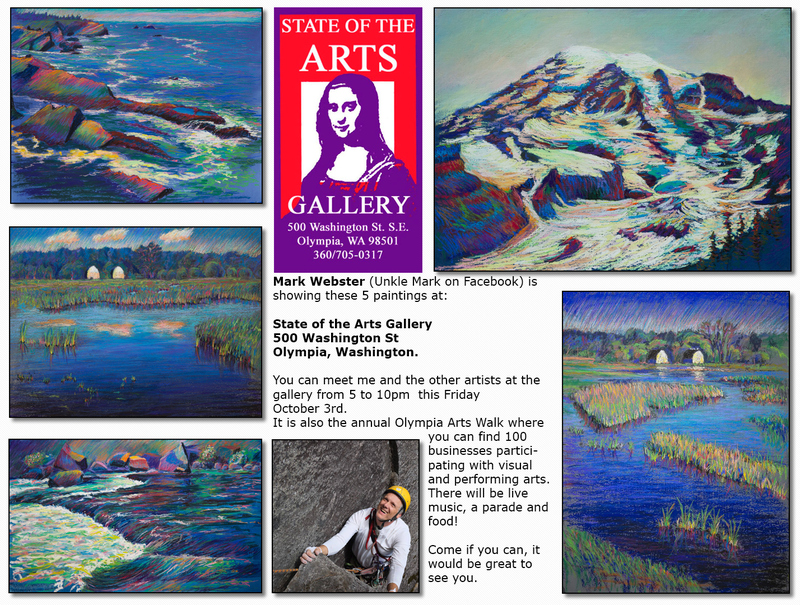 I have 5 paintings in State of the Arts Gallery in Olympia. 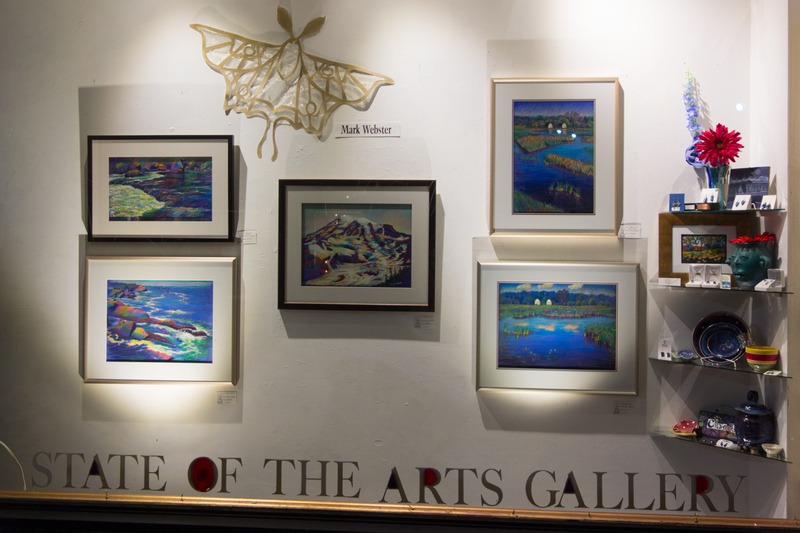 I went to the artist reception Friday night for the show that will last about a month. Here is my window on 5th avenue. Five friends stopped by to see the show. I also met the Barbara Newton, who was the featured artist. Her work is stunning, and made me feel very humble. She has an understanding of color that I have not yet acheived. While I stood by my window of unsold paintings, she sold a $1100 painting to a collector who already has 8 of her previous paintings. It was cool to watch, and I was happy for her. She was very kind to me and offered a number of great suggestions. 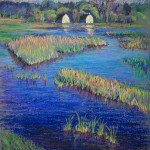 She reccommended that I copy one of my existing pastel landscapes as 6×8 inch painting and sell it on dailypainter.com. She sells half a dozen paintings there some months for very economical prices hovering around $60 to $100. They are unframed, which keeps the costs down. I’m thinking that this winter, I could copy some of my unsold paintings down to 6×8’s, and use oil as the medium. I started in oil back when I was a teenager, and still have that box of paints. I would love to experiment with palette knife painting. My paintings will be there for a little over a month. As I watched people walk by my window, I kept reminding myself that I’ve really just started painting again this Summer. I’m coming out of retirement, and can’t expect to be as good as a full time professional artist. Even if my paintings don’t sell, I’m going to keep at it. After all, Van Gogh sold one painting in his entire life. He had the passion to keep going even when the art community ignored him. I’ve already sold over 60 paintings, and that is as a weekend painter. I should be able to improve considerably over the winter. Perhaps I will even get good at oil paints. I love the way they look. They can be loose, or as tight as anything. They are cheaper to frame…often hanging with no frame at all. 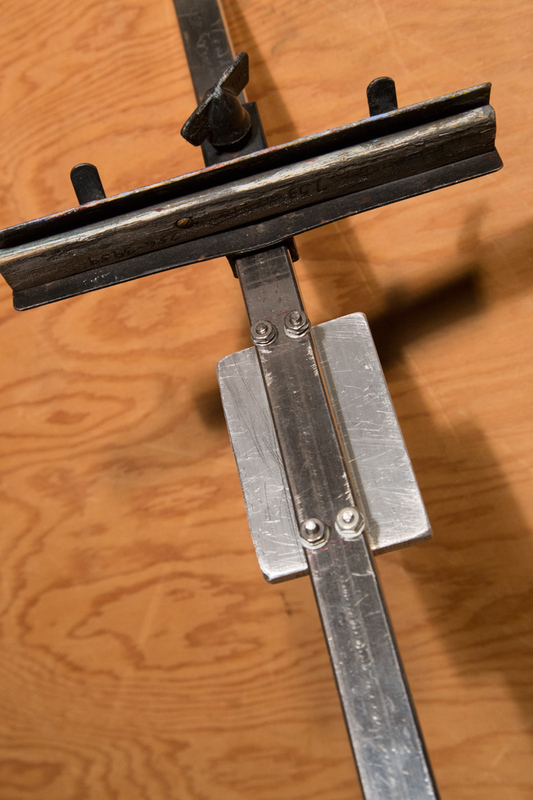 They are also cheaper to use, and simpler from a materials stand point. I’ve often wanted to work on larger paintings, but pastel is so expensive to use, while oil can be very economical. It’s going to be a bit of a learning curve…but I’d far rather spend it learning to do something I love, instead of learning another programming language like C+, or Java, or Python. I mean jeez, give me a break. I love web design…but only as a job, it’s not a consuming passion anymore, and I certainly don’t want to do it full time. Still, with my reduced hours at work, and no paintings selling right now…my visa card is rapidly becoming a monster. We had a wheel bearing hub go out, and a fridge. The bills keep coming in. But I guess that is life. I have a painting to work on in the studio, I’m out of here. I was off for 23 days. On Labor Day we had dad’s 90th birthday with my sister, her husband, their daughter Ginny, my Aunt and Uncle, my brother and his wife. Our kids had to work, but Sue and I went down with a salad. Brent cooked a salmon at Burfoot park where it was pouring down rain, then went up to dad’s at Panorama for a slideshow of 35mm slides dating back to the fifties and sixties. The inlaws were bored out of their minds, but it was riveting for us siblings to see back in time 50 years ago. In many of the pictures we could only see the backs of our heads, but we were able to recognize the clothes and knew who we were looking at back over the many years. I framed a couple paintings through Labor Day, but arrived at Squamish on Tuesday evening without a partner. I learned later (in Smith of all places) that the campground at the Chief is the hotspot for finding partners. I tried to paint Penny Lane, but it didn’t work. Marty showed up and we began climbing all the usual warm up routes at the Smoke Bluffs. Our best day was when we did 7 pitches up to Memorial Ledge via St. Vitus Dance and Karen’s Math, which I hung on once after the traverse. Sue and Lisa showed up for 3 days. They hiked the Black Tusk (18 mile round trip), rode mountain bikes at Whistler, and climbed one day. I led the nine at Octopus Garden and felt super solid. Those moves stuck in my mind for days. It’s funny how a good climb leaves you feeling warm and fuzzy. Marty left after his usual 4 days and I drove South to do more framing and see Sue. My nephew John was available so I drove to Smith. He is a very capable 10C sport climber and we teamed up on Wherever I may Roam, J-T’s route, Moonshine Dihedral, and Karate, which I again led clean…to my great surprise. That route is all about staying calm, milking the rests, and using some critical tiny footholds on the traverse. I placed all my traverse gear (Blue and green) from the last good hand jams, both vertical and horizontal. 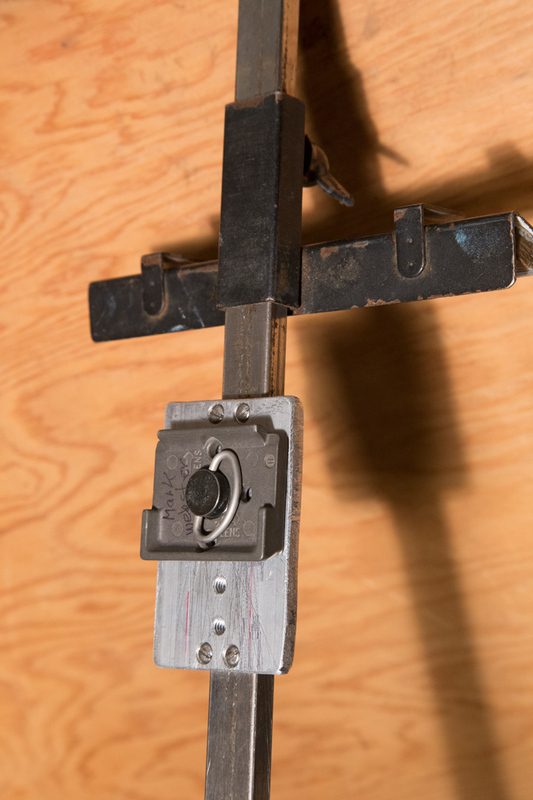 They are both wrist bone lockers, so it’s relatively easy to hang there and set up the traverse. I painted for two days, completing a couple nice, but troubled paintings, and then Richard showed up. We did the Monkey on the first day via the 5.8 river side cracks. Exiting the mouth was scary, as was the rappel, but it was a grand adventure. We met a married couple from Yosemite who swung lead up Monkey Space 5.12 trad. They were an amazing couple…so talented. And she was a nursing mom. His parents were climbing with them two days later, kids and all. We also did Zebra Zion. Richard combined the first two pitches, I led the traverse, and he led the money pitch. That traverse is only 5.7 for the first 15 feet, then it goes to butter sized foot holds and good hand crimps in an easy rising traverse to the ramp, which protects well with finger sized gear. I wasn’t sure I could have led the 10a pitch, but maybe it was just the heat. It must have been over a hundred in the dihedrals. Highlights of that four days were White Satin (bring two blues and 4 yellows), and The Outsider, which felt rediculously easy. At the crux there are huge foot holds. It is literally a stairway of flat one inch spearmint gum sized foot holds. You stand up on those and stick your fingers in two perfectly sized finger holes, almost as good as a bowling ball. Pull up on that, move your feet up on very nice jugs, and clip the bolt. I have at least 6 paintings that are good except for minor touch up details like sky, or unfinished foregrounds. Most of them simply needed another day of work on location. I will be chipping away at them over the new week or two. I have 4 going down to the gallery this week, while I need to pick up two unsold paintings from the Fair. I’m teaching 3 hours a day, 4 days a week this quarter. This means I have a lot of time to pursue my dormant art career. It’s been there waiting patiently for to return. I feel like it’s a greenhouse that’s been boarded over. Most of the plants had died, but the roof is still good, though the glass needed a good cleaning. And I needed to brush up on my gardening techniques…perhaps even try some new and unusual plants. I took 13 new paintings down to my old gallery in Olympia today. Deb was very nice, as always, but I could tell she was impressed with my new work. It’s noticely better than my old work from the 1990’s. It was nice to get a professionals opinion on my work. As opposed to my friends, and my family. They appreciate good work, but Deb knows what sells, and I value her opinion. We are planning a show in the future…but for now I’m going to continue painting new work. I rarely do a bad painting now. A lot of things have come together for me now that I’m working almost full time as an artist…assuming you count weekends, Fridays and before/after my day job. Simple things that used to bite me like sun angle and low tide have become non issues. I anticipate where the tide, or sun is going to go, and start my painting knowing that I will have the drawing work done when the sun or tide is at the optimal direction, or height. I’m also using Claude Monet’s trick of returning to the same spot at the same time multiple days in a row, weather permitting. As I write this I have two lovely paintings waiting for me to nail the same sun angle before they can be completed. I’ve even become better at tweaking paintings from photographs. Let me rephrase that…I never paint from photographs, but I will occasionally do touch up work to paintings after the changing light forces me to retreat to my “studio”. For example, I painted a lighthouse from a rock at low tide. After I completed the stone structure of the lighthouse, the tide came in, and it started to rain. I still needed to finish the sky and the ground…but we were 300 miles down the coast chasing sunshine. I finally got back to it two weeks later. I brought up the images I had taken on the scene while I painted and found them almost entirely useless. But seeing them brought back a few memories of the experience, and I was able to finish the painting. The sky started as just a gradient, but ended up as a bank of low, rolling fog. I must have seen it somewhere, because it came flowing out of my memory onto the painting. A month ago I started a painting of Mindy. 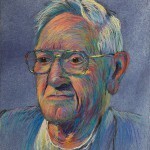 It was my second portrait in 4 years, the first being dad’s back in May. 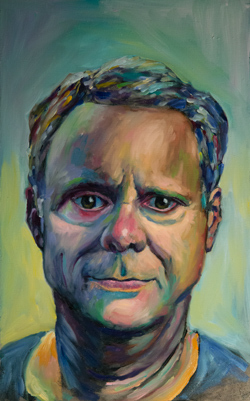 I love portraits because I can control the light better than plein air landscape paintings. I also love seeing a human being rise up off the paper and breath. Mindy and I go back a ways. She is a climbing buddy as well as a guitar playing friend. When she very kindly offered to pose for me I thought we would finish it in a couple sessions. However, it took me three sittings to complete it. The last session/sitting was out in Fletches back yard. He and Lisa were harvesting honey from their bees. Sue was kibitzing around, watching me paint Mindy, talking to Mindy, or watching the bee action. With all the commotion, I was surprised that I got any work done. But all the practice I’ve been getting lately has made me like one of those war correspondents hammering out a story in the midst of battle. Nothing interrupts my flow once the spigot turns on. Another way to say that would be: once I get in the zone, nothing distracts me. Fletch would glide by and take pictures every half hour or so. I’ve not seen them yet, but I bet there are some good ones. After a couple hours I thought it was getting better but I can never be sure. I get so wrapped up in a long list of things that need to be improved, that I often can’t see what is done and good. But after 3 people said it was awesome, including Sue, who always speaks the truth, I thought maybe I should call it done, or at least take a break. That got me worrying. It’s true that I’m not good with wrinkles. They are very hard to draw with blunt pastels, so I only draw the biggest ones. A more important issue for me is getting the underlying bone structure and major features in the right place. Once I get the major facial structure in place, I sculpt the fall of light across the shape. Then I rough in some hair, bring light and life into the eyes, and model the lips…it’s basically done. At that point I could think about looking for wrinkles…but why bother? If I see life, and a likeness in the painting, I don’t really care how old or young it looks. Once it breathes, my job is done. Here are the 3 new paintings I talked about in previous posts. 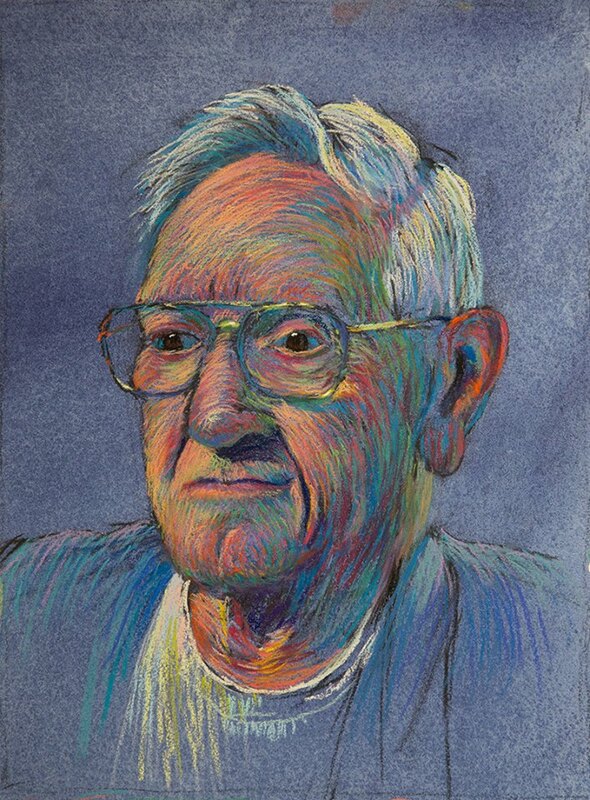 Since painting the portrait of dad, I’ve started 3 new portraits of people who liked dad’s painting, and offered to sit for a portrait of their own. At this point, I’m not doing these for money, it’s just for practice. I’m unsure what will happen to the portraits. I may enter them in a show, or an art competition. But eventually they will belong to the people who posed for them. I sort of owe them, since I would have to pay an artist model $30/hour to pose for me. And at seven or more hours per portrait, I can’t afford to pay models. Working on friends is a perfect fit. I get practice, and they get…at the very least, a nice image for social media, definitely a print, and maybe even, at some point in the future, the original….once I’m ready to let go of it. Sue and I drove down to Olympia to paint Saturday. I’d planned to pick up dad and take him out to the park where I planned to paint. When we got there he said he didn’t want to be stuck somewhere for 3 hours and declined our invitation. He was right. I spent 5 hours painting, from 1 to 6pm, standing at the end of a marshy point, balancing on a couple logs over 5 inches of water. 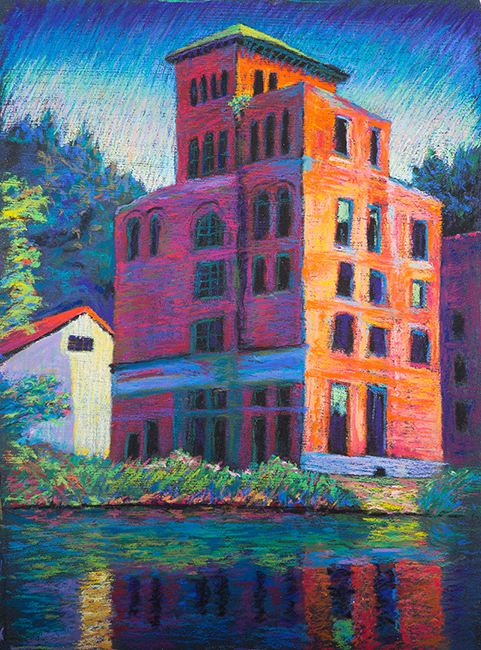 I got a good start on a lovely painting of the old Olympia Brewery. Today (Sunday) I put the painting on my easel. I set my laptop next to my easel, and pulled up the photo I’d taken of the brewery. I noticed a few details I’d missed and added them to the painting. But mostly I found myself staring at the painting. It spoke to me far more than the photo. I know of course that many artists work from photos, but it’s never worked for me. I need to feel the immediacy of the scene, to hear the birds, and feel the life around me. And my eyes see far more than my camera can ever capture. As I worked over the painting, I watched almost in amazement as my fingers grabbed the wrong colors, and made them look right. I made wild guesses at colors, and most of the time they were true. I can almost compare it to a jazz player riffing out a new melody that only he can hear, striking each note with perfect pitch and timing. I made a few mistakes, but I caught then immediately. After a couple hours I started feeling cramped and carried my easel out in to the sun. Blue sky and clean air make me paint better. Sunshine is awesome light to paint in. When the sun went down, I got out my video light and painted on in the shadows of the back yard. I’m hoping that my eye for color, light and design will become more refined over the summer. I will only be teaching part time, and I’d like to be able to call up my “muse” at will, on each day off. My hope is to have enough good work for a gallery show.